If you’re looking for ways to ensure your family stays connected, look no further than the evening meal. Dr Laura Markham says having dinner together is life-changing – for everyone. You’ve probably heard that having dinner together as a family is a good thing for your kids, but you might not realise that it could change your child’s life. Dinner is the best predictor we have of how kids will do in adolescence. The more frequently kids eat dinner with their families, the better they do in school and the less likely they are to get involved with drugs or alcohol, suffer depression, consider suicide, or become sexually active during high school. 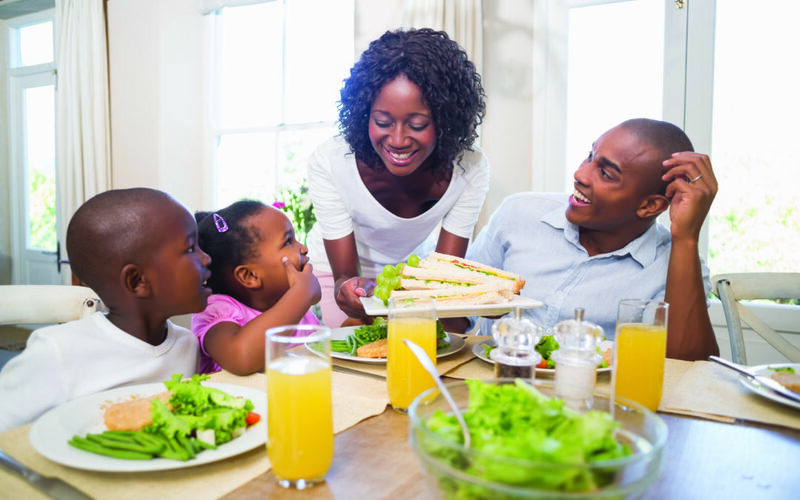 Families who eat together talk more,which helps them stay connected. Parents who show up to eat with their kids are more likely to express their love constructively in other ways too. Families who offer kids a bit more structure are more likely to keep kids attending to their homework, as well as out of trouble. Dinner transforms individual family members into a ‘group’, which gives parents more clout than their peer group. Children, even more than the rest of us, need something to count on every day, such as the tangible security of belonging and being nurtured, represented by the ritual of sharing food with those we love. Whatever the reason, dinner is a pretty easy insurance policy to build into your home life. If you’re too busy to have dinner as a family on a regular basis, it’s worth re-examining why, given how important it is. Here are a few tips to connect more as a family during dinner. If you walk in the door from work exhausted and have to rush to get dinner on the table, you won’t have any internal resources left by the time you sit down. Try putting out healthy snacks (carrots and hummus, cheese and crackers) as the ‘first course’ while you take 10 minutes to wind down. After that, you’ll be more relaxed while you get dinner on the table and sit down with those people you adore. There is nothing magical about exhausted parents, cranky kids, and take-away food. However, with minimal effort, we can create a daily, short but restorative, celebration of family, which offers refuge from the trials and tribulations of ordinary life. Some families do this by lighting candles, while some say a short blessing, which may or may not be religious in nature. The most important component, though, is the attitude of celebration and appreciation. The point of sitting down to dinner is to connect with each other, not what is being eaten. I never knock myself out with an elaborate meal on a week night, when it’s just our family eating. There are plenty of easy, healthy, kid-pleasing options out there, and my advice would be to eat simply, and save your energy for making the dinner table pleasant, rather than cooking a meal that leaves you even more exhausted at the end of a long day. Some families resist the temptation to turn on the TV during dinner by placing it where it can’t be seen from the table. Many impose a rule that no one answers phone calls, even if Mom or Dad gets an important work call, and turn off cell phones so they can’t be heard. Protect this special time with your family from interruptions. As former US President Barack Obama said about prioritising dinner with his daughters, the world will still be there in half an hour, even if you’re the president. Some families take turns choosing the appropriate background music or being in charge of dessert. Some rotate who says the blessing or chooses the discussion topic. In some families, Tuesday will be pizza night and Friday is family game night or the Jewish Sabbath. It’s the fact that you always do the same thing that reinforces the ritual aspect, and creates the feeling that this is home, and family, and regardless of the day’s difficulties, life is good. For some parents, saying grace is a time-honoured tradition they wouldn’t think of overlooking; for others it feels foreign and artificial. But blessings are not necessarily about God. Blessings are about us: our gratitude that we are able to sit down to a meal when others are hungry, our appreciation of each other, our honouring the person who prepared the meal and the bounty of nature that produced it, our awareness that in this moment we have everything we truly need. It shouldn’t be just adults talking about their jobs. Some families rule job-talk off-limits, but kids can learn a lot by hearing about their parents’ days sometimes, as well as their own. Try a quick check-in round of “So how was school/work today?” This will often leads into a topic. Many families formalise this with a ‘rose and thorn’ type activity, in which each family member shares the best and worst of their day. But what do we talk about? Write possible agenda items on index cards and put them in a kitchen drawer, so if you’re just too tired to think on some evenings, you can still have a rewarding and re-energising discussion by just pulling out a topic. Families who have already created a culture of discussion will have an easier time with this than those who introduce it to older kids, but don’t give up. Kids who don’t speak up can often be coaxed to talk by asking them specific questions about their interests. Don’t offer advice unless asked, and your kids will be more willing to bring up what’s bothering them. Kids often gain insight into solutions just by talking. Your kids won’t always say things in ways that are easy for you to hear, but try to see it from their perspective. Bite your tongue or cover your mouth (literally, if necessary) , so that you don’t interrupt, and hear them out. Breathe deeply so you stay calm. Defer unpleasant topics. Kids who begin to squabble can be asked to come up with five things they really love about the sibling with whom they’re fighting. Adults who start to complain about their day can be asked to add “and my life is blessed” to any complaint and fined five rand toward ice creams on Sunday evening. Most families can’t eat together every night. Sometimes an adult is out of town, or a child has a school event. But you can create the expectation that on certain nights, everyone comes home for dinner. Start small, if you need to, with one or two nights a week. Even those limited by a long commute or odd hours can often manage a night or two, and those nights become extra-special for everyone. Or at least play with your family while you’re eating your food. Creating a sense of fun and play at the dinner table is the single best way to make everyone look forward to that time together, and sets a wonderful tone in your house. Laughter really is the best medicine after a gruelling day. Once the kids get used to helping with dinner preparation and clean-up, the group effort can be fun, and of course, it’s a great learning experience for them. Most importantly, it changes the dynamic of one adult (usually a woman) serving everyone else. Start small, with everyone gathering to set the table together and get the food onto the table. For clean-up, rotate who is in charge of music, create a festive mood, and involve everyone. Make a big deal out of birthdays, accomplishments of any kind, seasonal changes, and famous people’s birthdays (what a great opportunity to talk about why you admire Mahatma Ghandi, or Albertina Sisulu!) There’s always something to celebrate. Just making it through each day intact as a family is worth celebrating!